Seikokan Dojo is a place of training and growth in the traditional Japanese martial art of Yoshinkan Aikido. 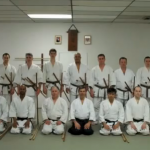 Seikokan Dojo provides advanced instruction for all levels. Challenge yourself by studying this deeply rewarding martial art. Seikokan Dojo is conveniently located near transit and major roads in Windsor, Ontario. We are dedicated to the teaching and in depth training in Yoshinkan Aikido a traditional Japanese martial art. Our teachers and students work together to achieve personal bests in the pursuit of the amazing martial art. The Seikokan* Aikido Dojo brings Yoshinkai Aikido training to Windsor, Ontario’s Grand Marais Plaza location. Under the direction of chief instructor Sensei Mark Lemmon, 6th Dan, students will be taught the techniques and way of Yoshinkai Aikido; a way based on the ancient code of the Samurai. *The Seikokan name was given to Sensei Lemmon by Kiyoyuki Terada Shihan, 9th Dan; Yoshinkai Aikido’s most senior student and highest ranking person. To understand the meaning, one must look at the component kanji. SEI means spirit, KO means wide open heart and mind, calm like the ocean, life in prosperity. KAN is house or place of training. Seikokan literally means “Purely beautiful and wealthy minded house open to any persons who love Aikido”. (Y. Ishiguro, Foreign affairs committee Yoshinkan Seiseikai, Japan). The Seikokan Dojo is registered with the International Yoshinkai Aikido Federation.